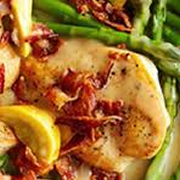 In 12-inch fry pan, cook chicken and bacon over medium-high 12 minutes, turning to brown evenly. Carefully add broth; cover and cook 3 to 5 minutes more or until chicken is tender and no longer pink. Meanwhile, in microwave-safe 2-quart dish combine asparagus, squash, and 2 Tbsp. water. Sprinkle salt and pepper. Cover with vented plastic wrap. Cook on high 5 minutes, until vegetables are crisp-tender, stirring once. Transfer to plates. Drizzle cooking liquid; top with chicken, bacon, and onions.